Managing Reputational Risk shows how any organisation can apply simple risk management principles to build stakeholder confidence and safeguard and enhance reputation. It positions reputation and its associated threats and opportunities where they rightfully belong: in the domain of the board room, at the heart of good corporate governance, leading-edge strategy development, effective risk management, corporate responsibility, comprehensive assurance and transparent communications. * Illustrates, through numerous examples of good - and not so good - business practice, the importance of respecting and nurturing reputation as a critical intangible asset. * Demonstrates how mastery of reputation risks can enable an organisation to be seen as responsible and responsive, as well as equipping it to meet the challenges that lie ahead. Jenny Rayner is an independent UK-based consultant. In 1999 Jenny founded Abbey Consulting to provide consultancy and training on the positive management of risk to improve performance and protect and enhance reputation. Her previous corporate career spanned over 20 years in a wide range of sales, marketing, purchasing, logistics, supply chain and general business management roles, latterly as a Chief Internal Auditor with ICI. Jenny writes and lectures extensively on risk management, corporate governance, corporate social responsibility and reputation. She is executive editor of the Business Risk Management Handbook and joint executive editor of the Corporate Social Responsibility Monitor. Her study, Risky Business: towards best practice in managing reputation risk, was published by the Institute of Business Ethics in 2001. Jenny lives in Cheshire with her husband Keith and daughters Jo and Dani. Chapter 2. The Business Case for Reputation Risk Management. Chapter 3. Risk Management: An Overview. Chapter 4. Identifying, Prioritising and Responding to Risks. Chapter 5. 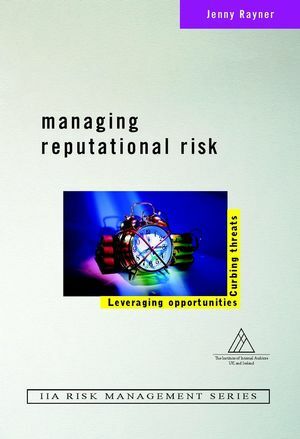 Making Reputation Risk Management Everyone's Business. Chapter 6. Managing Threats and Opportunities to Reputation. Chapter 7. Reputation in the Spotlight. Chapter 8. Peace of Mind Through Audit and Assurance. Chapter 9. Bolstering Reputation Through Transparent Reporting and Communications. Chapter 11. Towards a Sustainable Reputation. Chapter 12. Future Challenges and Opportunities. Appendix A: The Hermes Principles. Appendix B: Appendix to the Turnbull Report. Appendix C: BP's Policy Commitment on Ethical Conduct. Appendix D: Twelve Steps for Implementing a Code of Business Ethics.